Last Sunday — when many folks were either at the downtown Fine Arts Festival, Library Book Sale, beach, or otherwise enjoying the delights of a Westport summer — a dozen quickly responded to our “06880” photo challenge. They knew that Bob Weingarten’s image showed another local gem. In fact, it was described variously as across from Rive Bistro restaurant, the VFW, a medical office complex and the Saugatuck Rowing Club. Lots of people see it, from lots of different places. Only Valerie Port, though, described it by where it is, not what it’s across from. She said it’s at “the end of Oak Ridge Park” — a private road off Imperial Avenue. Kudos to Valerie, plus Jana Moorman, Bobbie Herman, Diane Silfen, Ralph Balducci, Jay Tormey, Sylvia Robinson Corrigan, Mary Ann Batsell, Jonathan McClure, Seth Braunstein, Amy Schneider and Peter Tulupman, for answering correctly. And thanks for taking time out of such a beautiful day to do so. It probably was a momentous occasion, in 1932. In the intervening 86 years though, most Westporters have forgotten it exists. If you know where you’d find this, click “Comments” below. This entry was posted in Photo Challenge, Saugatuck and tagged Oak Ridge Park, Rive Bistro, Saugatuck River, VFW, Westport Rowing Club. Bookmark the permalink. It’s on the green at the corner of Old Hill Road and Kings Highway North. It is at the corner of Myrtle Avenue and Church Lane, on the lawn of Christ and Holy Trinity Church.. Very impressive, Tom, Bob and Jill. I’m impressed that you knew this! Dan: Are you sure that this plaque is on the green between Old Hill Road and King’s Highway North? Historical references place it on the east lawn of Christ and Holy Trinity Church. There is a plaque on the east lawn of the Church today, which looks like the plaque in the photo challenge. 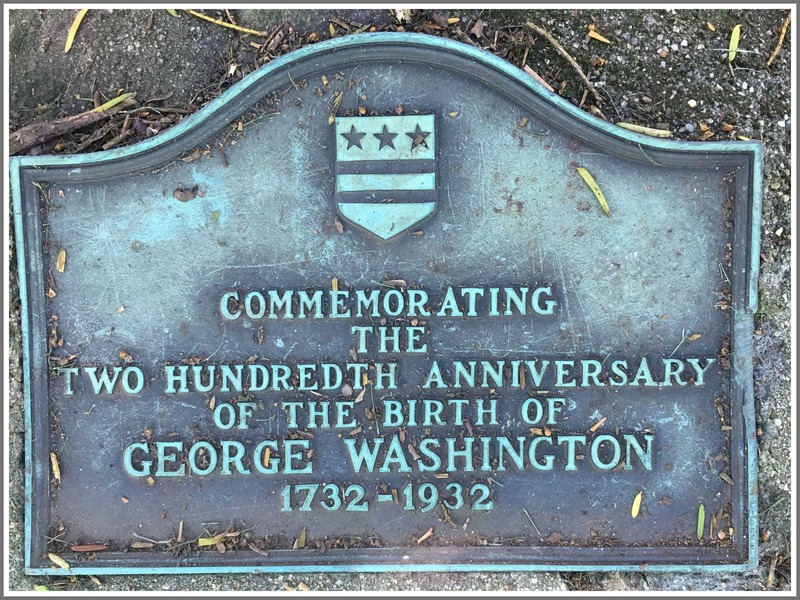 Perhaps there were 2 plaques placed during the bicentennial of George Washington’s birth? Does the one at Christ & Holy Trinity Church reference the site of the former Disbrow Inn? Yes, I believe the one at Christ and Holy Trinity church references the Disbrow Inn. I lived on Edgehill Ln. I remember seeing it in my travels around tbe neighborhood.